Edited by Dr. Ted Loder and Bill Costantino. Many over-unity researchers are attempting to harness the unique properties of pulsed motors. The Orion Project has started to conduct research on devices that will ultimately be able to self-power and provide enough additional electrical energy to cover all the requirements for an average home. A pulsed permanent magnetic motor/generator (PMG) is one such device. We are presently working with a team of researchers who have studied and experimented with these devices and are now developing a one-half scale PMG to prove the principle. Once we have a reliable proof-of-concept prototype, we will scale it up to determine if larger power requirements can be met. The following article is intended to give you a better understanding of this technology. A pulsed motor, unlike normal A/C or D/C types, uses short pulses of current to drive the motor, making it spin. The part of the motor that spins is called the rotor. Typically, it is quite heavy, acting as a flywheel, and has multiple permanent magnets spaced equally around its periphery. These magnets are usually extremely strong and can be arranged in a variety of different configurations. The example figure at right shows all the magnets facing radially outward. The stator is the stationary part of the motor that surrounds the rotor. It holds one or more electrical coils. They are positioned so that the magnets line up with the coils during part of the rotation. 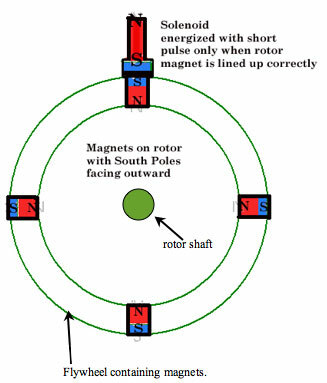 The coils are energized when they are exactly lined up with the permanent magnets in the rotor. This requires very precise timing, usually achieved through some type of electronic control circuit. The electrical coils are normally wound so that, when energized with a short pulse of current, they produce a repulsive force. This repulses the magnet in the rotor, causing it to rotate. After being energized by a short pulse, the magnetic field formed around the electrical coil then collapses. As it collapses a current is produced in the coil (sometimes called “back EMF” – electromotive force). This current is small but valuable and can be harnessed, stored or otherwise utilized. This current is equal to the input energy, minus resistance and heat losses, and is the feature of the pulsed motor that is exploited by most free energy researchers who work with pulsed motors. The circuitry of pulsed motors consists of two prime functions. Controller power circuits that produce the rotational torque by delivering pulses to the electrical coils at a precise moment during the rotation of the motor. Harvesting circuits that store back EMF and also any power generated by the magnets moving past other wound coils to produce power. Conventional AC or DC motors simply consume electrical power at a steady rate with no regard for energy recovery. Inventors working with PMGs are keenly focused on recovering every bit of available back-EMF energy. The closer they get to this goal, the closer they are to creating a “free energy” motor. If such a motor is possible it can be used to drive an electrical generator thereby providing “free energy” for a home, business, or industry. The Orion Project has a talented and cross-functional team of inventors and scientists working on this most promising opportunity. This description is based in part on Robert G. Adams’ patent: Adams Switched Reluctance Pulsed DC Permanent Magnet Motor Generator (UK Patent, GB2282708).